Thermal Imaging (TI) detects objects based on heat emitted by them. A variety of advanced thermal imaging riflescopes are being used in military roles like patrolling, engaging targets and for use with snipers. In the early history of warfare, armies were meant to rest at night as the soldiers could not see in the dark. But there was a continuous effort to use the darkness to achieve surprise. Use of moonlight for aiming and use of stars for navigation are some examples. Simple gadgets like the prismatic compass and other navigation aids combined with detailed day time reconnaissance were employed for operations at night. But modern technology like image intensifier and thermal imaging has enabled the military to fight during the night, almost as it was day. To operate more effectively at night, US Army has given $391.8 million three-year contract to L-3 Insight during May, 2018 for the ENVG-B. The ENVG family represents helmet-mounted night-vision goggles that blend image intensification and long wave infrared sensors for combat at night, in bad weather, and in smoke and dust. Harris and L-3 Insight are building ENVG II, while BAE Systems and DRS are building ENVG III. ENVG III weapon sights also has an improved resolution and a wider field of view which enables rapid target acquisition. The FWS-I, when mounted on a soldier’s weapon, will transmit its sight picture through radio to the ENVG III, which is mounted on a soldier’s helmet. The FWS-I is designed for the M4 and M16 rifles, and can mount on those rifles in front of day sights that have already been bore-sighted. The ENVG will combine thermal imaging with image intensification technology. A variety of modes will allow soldiers to see in their goggles only the image from the ENVG III itself, only the image from the FWS-I, or a combination of the two. Using a ‘picture-in-picture’ mode, the image from the FWS-I is displayed at the bottom right of the image that is coming from the goggle. This combines the rapid target acquisition technology and can be effectively be used for surveillance, aiming weapons during daylight, darkness, adverse weather and dirty battlefield conditions. This system should be with the U.S. Army by the first quarter of 2019. L-3’s AN/PSQ-20B ENVG L-3 Insight. AN/PSQ-20B ENVG is a helmet-mounted dual waveband monocular which enables the user to view images through one eye, but not through two eyes as a binocular device can. The AN/PSQ-20B ENVG provides improved targeting and identification by fusing image intensification technology with thermal imagery to bring out the best in both sensors. The models include handheld, helmet-mounted or weapon-mounted systems. And if you already have a day optic sighted in, the IR-PATROL can be placed in front and used as a clip-on device for 24-hour tactical usage. All the models have a sensor resolution of 640x480. Hand Held. LE100 & LE100C have Advanced Thumbstick Controller, Ruggedized System Design, Full Digital Display and Objective Lens Cap. The M250XR (extended range)model has 7° FOV, 4.5x Magnification, Stadiametric Rangefinder, 640x480 Thermal Sensor and image capture. Helmet Mounted Model. Wilcox®Interface Shoe, 60 Hz High-Speed Frame Rate, Edge Detect Mode, lightweight design and Objective Lens Cap. The kit includes IR-PATROL™640x480 Thermal Monocular, Wilcox Interface, ShoeWilcox Helmet-Mount Interface Kit, 60 Hz High-Speed Frame-Rate Download/Video Cable. M300W Rifle-Mounted Model. The IR-PATROL™M300W is a mini rifle-mountable system that works as a dedicated or clip-on thermal rifle sight. When not in use, the optional Wilcox®Side Flip mount conveniently flips the IR-PATROL M300W out of the way for zero obstruction. It has fully Adjustable Reticle System, Clip-On Mode Included, Optional Wilcox®Side Flip Mount, Mini Thermal Sight and Objective Lens Cap. The kit which comes along with is IR-PATROL™640x480 Thermal Monocular, Reticle System (with Clip-On mode), Wilcox Interface Shoe, Wilcox Flip Mount Rifle Base, 60 Hz High-Speed Frame-Rate Download/Video Cable. Field of View is 22°, Magnification E-Zoom is 1x Optical/8x Digit, Display Type Digital organic lightemitting diode (OLED is a light-emitting diode display which works without a backlight because it emits visible light). It uses a CR123 Lithium Battery with a life of 1.5 hr. @ 60 Hz. Also has EDGE DETECT mode. Trijicon SNIPE-IR™. It comes with a 640x480 12 micron VOx sensor and OLED digital micro display that gives you clear, brilliant imagery at a fast 60 Hz frame-rate system—even through pitch-black darkness, has a advanced VisRelay collimating optic eliminates parallax. The Trijicon SNIPE-IR is optimized for use with a 4x day optic. NOSHOT ZERO Sight-In Easy sight-in integration for accurate calibrations and can be used in Clip-On, Hybrid and Stand-Alone Modes. Batteries 2 x CR123 with life of 3.5 Hours @ 60 Hz. 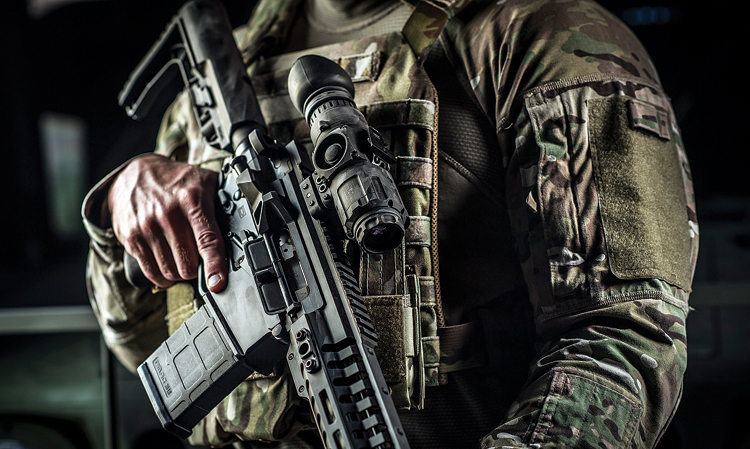 The company advises to combine their Trijicon ACOG®combat optic with the clip-on SNIPE-IR™thermal sight for having a lethal 24-hour advanced weapons platform for maintaining maximum situational awareness and engaging targets. BELOP (formerly BEL DELFT) is an fully owned subsidiary of BEL which started manufacturing Gen2 Image Intensifiers in collaboration with and as a Joint Venture with BV DELFT Netherlands in 1994. The plant is presently being upgraded to XR-5 grade with a capacity to produce more than 30,000 Image Intensifier Tubes per year. BEL also has plans to produce Micro Channel Plate (MCP) indigenously with ToT from PHOTONIS once the XR-5 is fully established. Night Vision Devices is one of the areas of strategic interest for Tata Advanced Systems Limited (TASL). TASL has entered into a partnership with Exelis Inc., the world leader in Gen 3 Image Intensification based NVDs, to manufacture and supply these systems to Indian Defence market. As part of the drive towards achieving indigenisation, TASL has set up a production facility in India, for assembly and manufacture of sub-assemblies and complete systems.